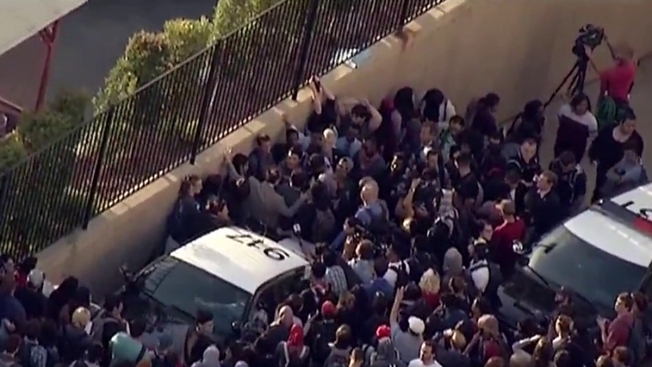 Dozens of students at San Diego State University (SDSU) gathered around President Elliot Hirshman’s car Wednesday evening to protest his response to controversial posters placed around campus. The posters reportedly named specific Muslim students at SDSU as terrorists and terrorist sympathizers. Students are now calling for President Hirshman to address their concerns. A statement was emailed out to students by President Hirshman and Vice President Eric Rivera regarding the incident. But students say President Hirshman did not condemn the actions. A copy of the statement was posted on Twitter by The Daily Aztec, SDSU's independent student newspaper. President Hirshman did step out of the car to speak to the student protestors. When NBC 7 San Diego reached out to SDSU for reaction to the protest, Chief Communications Officer Greg Block said the university did not have a statement.